1) The Bliain na Gaeilge team are looking for a creative & entertaining Instagram story about how you use your Gaeilge. 2) You must tag @gaeilge2018 in every snap you want to enter so we can see your story. 3) You can use photos, videos, boomerang, texts, superzoom etc. to put together your story. You can aim to have around 5 'snaps' in your story. 1) The competition is open to those aged 18 years and over who are registered as a third level student on the island of Ireland. 2) By entering the competition all participants will be deemed to have understood and accepted these terms and conditions. 3) If required, proof of age and student status will be requested of the winner. 4) The competition closes at 23.59 on the 7th November 2018. 5) The first place prize is an Apple iPhone X 64GB. The second prize is a subscription to Netflix for one year. The third prize is a subscription to Spotify for one year. 6) The prize may not be substituted for a cash alternative. 7) We reserve the right to share any received entries on any of our social media platforms: Twitter, Facecbook, Snapchat, Instagram for Raidió Rí Rá, Bliain na Gaeilge, Seachtain na Gaeilge, peig.ie and Gaeilge24. We also reserve the right to share any entries on the following websites: cnag.ie, gaeilge2018.ie, peig.ie. 8) The judging committee will choose the winners of the compeition. Their decision is final. 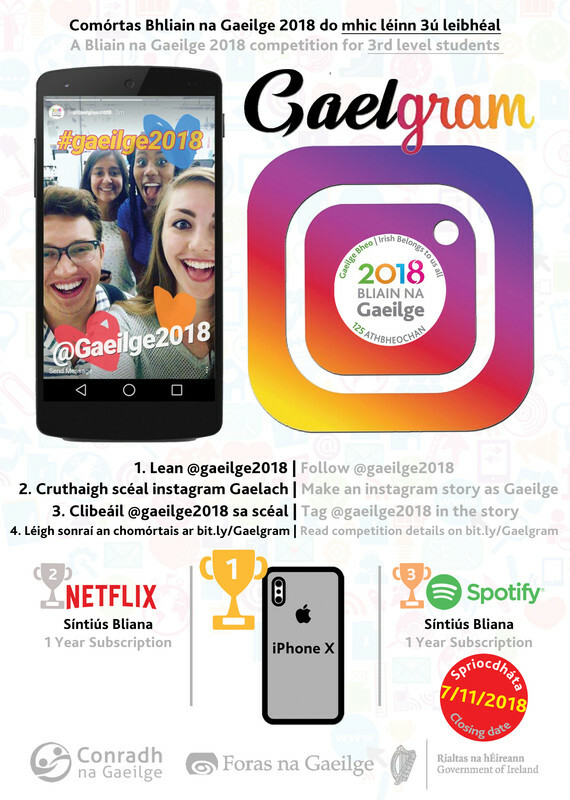 9) The winners will be publicly announced on the 9th of November 2018 on Bliain na Gaeilge's Instagram account. A direct message will also be sent to the winners. 10) If the Bliain na Gaeilge team cannot make contact with the winners within the first week of the announcement their prize will be forfeited and another winner chosen. 11) We reserve the right to provide an alternative prize of equal or greater value in the event of unforeseen circumstances.